Now that’s just hilarious. When you wiggle your toes, it looks like he’s sticking his tongue out. 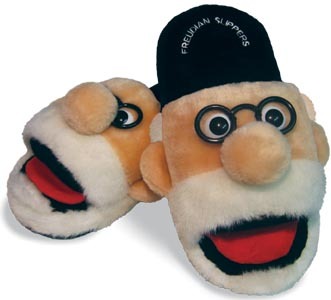 I just may have to get me a pair of these someday. Speaking of Freudian things…I finished reading The Watchmen this week, so now I can be an educated viewer when I go see the movie. I’ve never seen so much Freudian thought integrated into a plot! And since I didn’t come across this series when I was younger, I don’t expect to be indignant about changes like some folks seem to be. For example, I won’t be sorry to see the giant squid thing disappear from the storyline. That was just over the top. Alan Moore has some serious issues (no pun intended). 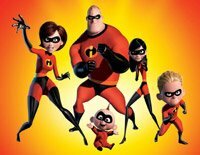 I also realized after reading Watchmen just how much the creators of The Incredibles must have been influenced by this story. Whole lotta striking similarities, but without the nihilistic darkness and gore. I’ll stick with The Incredibles, thank you. Kinda funny. I’m not much for Family Guy, but this is kinda funny.